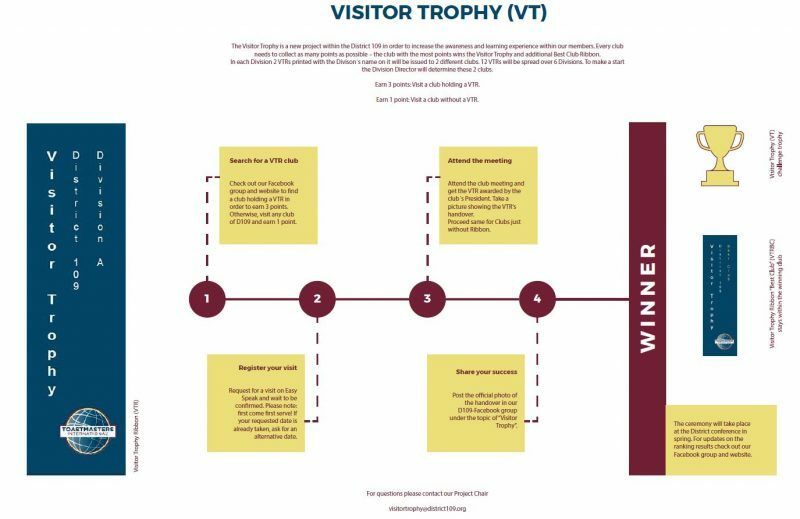 The Visitor Trophy (VT) is our new project within the whole District 109. In sum, 12 Visitor Trophy Ribbons (VTR) will be spread in our District. The challenge will be to catch as many VTRs as possible. Throughout collecting the VTRs you will be ranked by points in order to determine a winning club. Every year, at the Spring Conference the winner will get awarded by the Visitor Trophy, a challenge Trophy, and a winning Ribbon, which stays in your club forever. Visiting other Toastmaster clubs is a great experience and a way to learn from each other. In order to do so, we created a format to make it as much fun as possible. Please find enclosed a graphic for further explanation the new VT project. We hope that we all have a lot of fun with this new game! 2019/2020 is your Chance: Speak up! Lead! Grow!